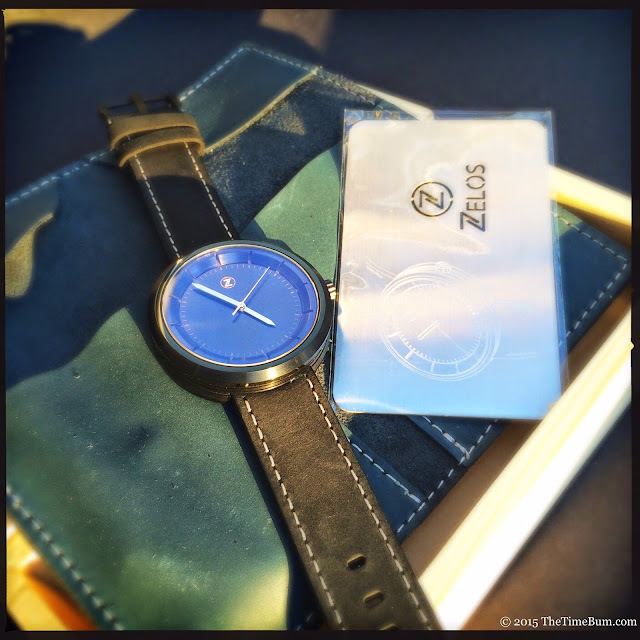 Elshan Tang of Zelos Watches has been very busy indeed. If you recall, after the wildly successful Helmsman project and the launch of the awesome Abyss, he brought us the Chroma and Skeleton, two variants of a modern dress/casual watch that absolutely shattered their Kickstarter funding goals. 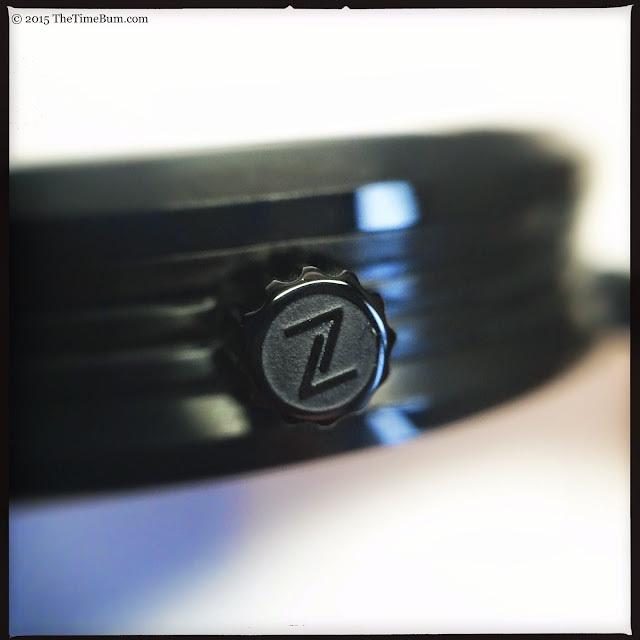 Those watches are now finding their way to lucky backers and new purchasers alike, and a black-on-black Chroma found its way to my door step for this review. The Chroma's lugless case, nearly sterile dial, and pencil hands all echo the popular minimalist-modern fashion. 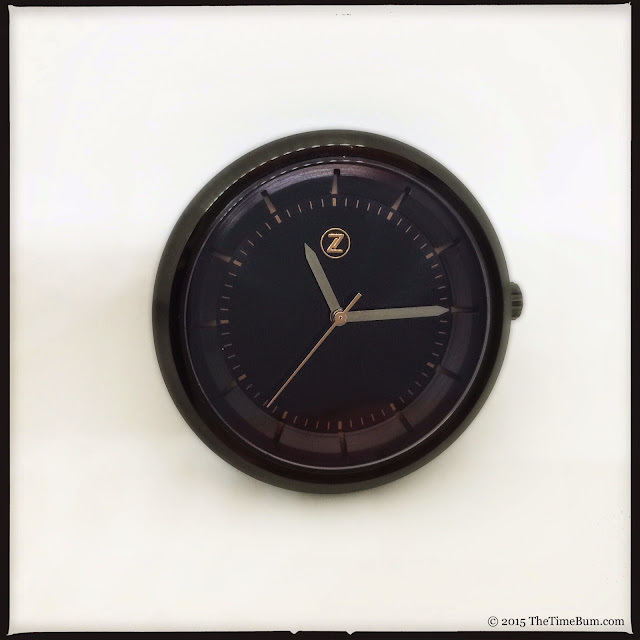 "Oh boy," you may think, "another minimalist Kickstarter watch. Like the world needs another one of those. Let me just return to the home page and..." Wait! Believe me, I understand your apathy, but you need to bear with me here. 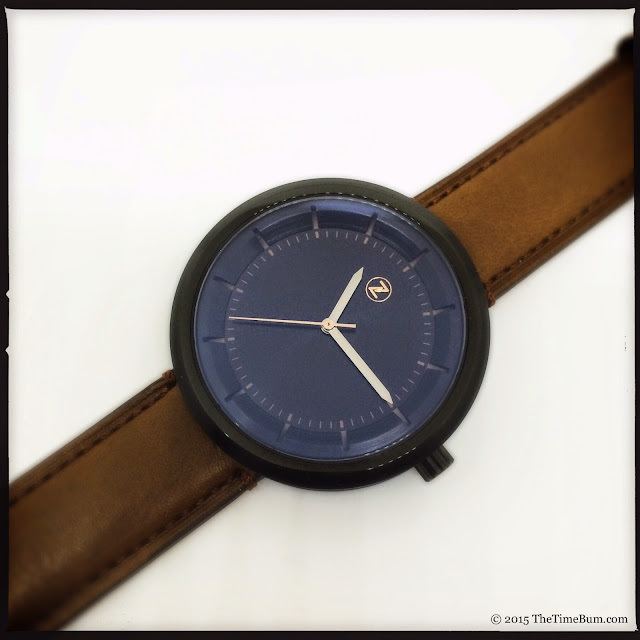 A talented designer can pull off a modern minimalist dial and not make another bland, cookie cutter watch. Elshan is one of those designers. You see, it's all in the details. Let's start with the face. We have a black dial, no numerals, no text, no lume, and no date. The only adornment is the Zelos "Z" logo at the top. So far, so good. Minimalism should be neither garish nor cluttered. Now it starts to get fun. There is a delightful sun ray effect to the surface, and the hours are marked by slots cut into the black rehaut, revealing tan printing on the surface beneath. This color is repeated on the index. The hands are polished, silver, and pencil shaped. The second hand is a simple baton in a rose gold color, as is the applied logo. That is it. The dial is simple and clean with some subtly clever touches to keep things interesting without breaking the aesthetic. My only criticism is that the minute and hour hands are completely flat, and occasionally disappear if they don't catch a reflection. I don't believe they detract from the design, but I think they would have added more had they been peaked to create two distinct surfaces. Moving to the case, we have a 42mm stainless steel cylinder, topped by a sapphire crystal with anti reflective coating. It wears a matte black PVD coating with touches of high gloss around the uppermost surface of the angled bezel, and the top and bottom layers of the case. A series of deep channels is sandwiched in between; another tasty detail that sets the Chroma apart from the rest of the "mini-mods." The prominent screw down crown grooved and signed. It operates easily and help bring the Chroma's water resistance to 50 meters. Without lugs to transition from case to strap, the Chroma appears tall, but in fact, its 11mm profile will easily slip beneath a shirt cuff. A sapphire display window offers a peek at the Miyota 8215 inside: 21 jewel automatic movement, 21.6k bph oscillation rate, power reserve of over 40 hours. This is a workmanlike unit, and does not offer a particularly fancy level of decoration. The cut away rotor planned on the prototype did not make production. 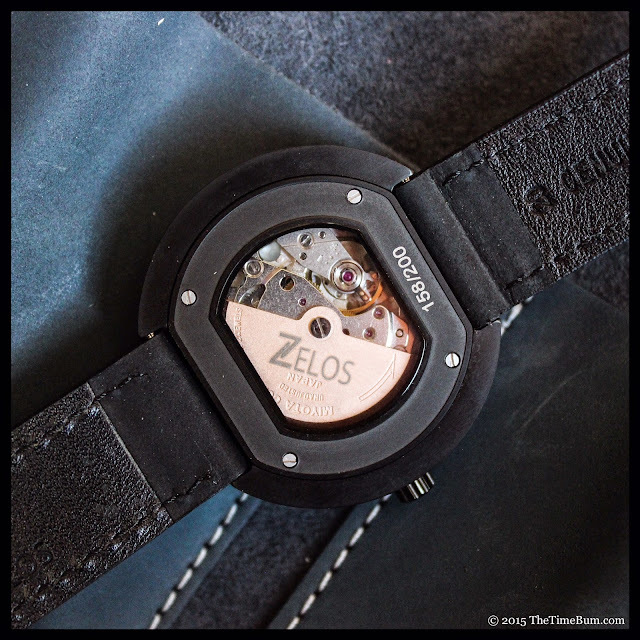 Instead, Zelos has added an engraved, rose gold PVD rotor. The view may be more functional than ornamental, but it fits the Chroma's character. Pairing it with casual clothing is easy, but the dress aspect is harder to see. 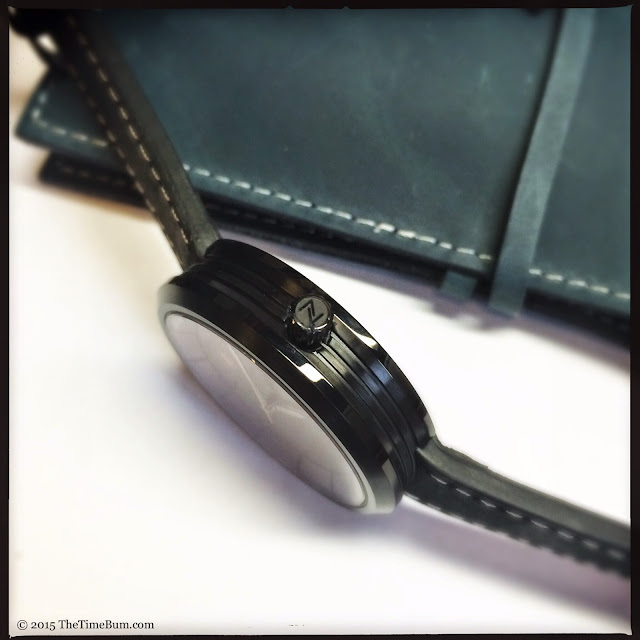 The watch arrived on a matte black Crazy Horse strap with white stitching. It is thick leather, 20mm wide, and does not taper. It looks great on its own, but it seems a bit too rough-and-tumble for the Chroma. After a quick root through my drawers, I came up with a lightly padded, calf skin strap. It is slimmer and far more tailored than the Crazy Horse, and the light brown leather paired beautifully with the Chroma's rose gold and tan accents. With the new strap in place, the Chroma looked right at home with coat and tie. If you decide to fit your own, find one that does not taper, and accepts a flat tang. 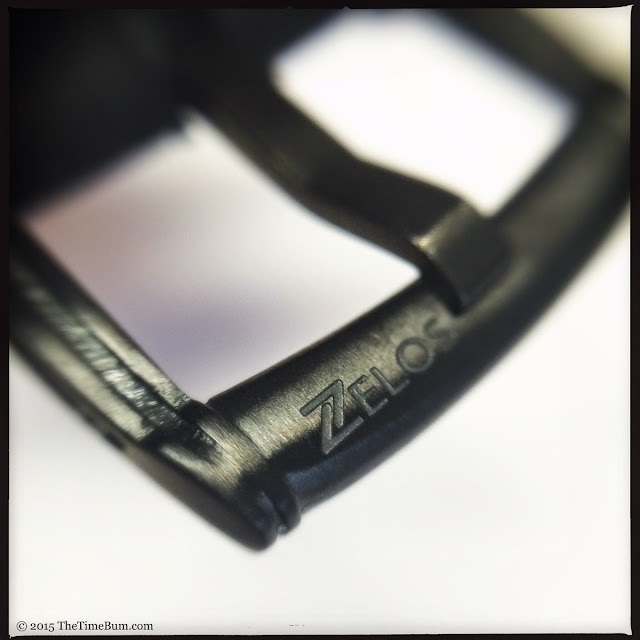 This will allow you to fit the signed and sculpted Zelos buckle, which exhibits the same attention to detail as the rest of the watch. 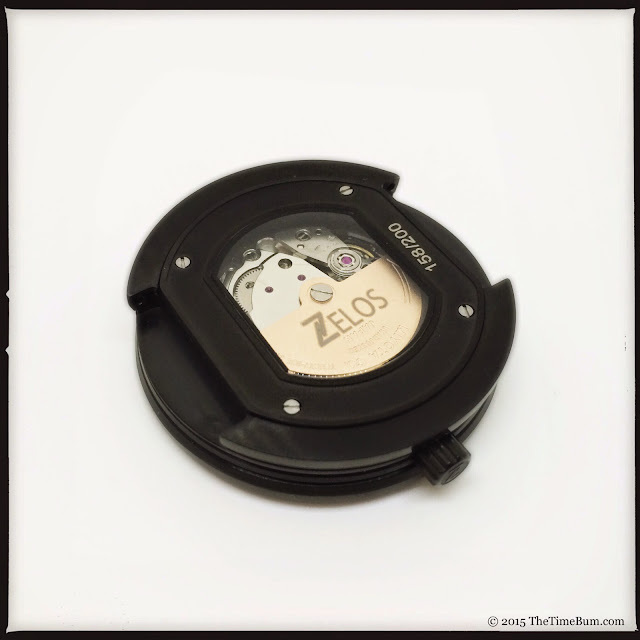 Finally, I have to say a few words about the packaging because Zelos is one of the few companies that actually ships its watches in something that adds value. The Chroma arrived tucked inside a blue leather, two pocket watch roll. The roll is protected by simple wooden box and is accompanied by a steel warranty card. Considering the dozens of display boxes gathering dust in my storage closet, a useful and attractive item like a leather watch roll is definitely a bonus. The Chroma sells for $299 on the Zelos site. Pro: Sculpted case, cutaway markers. Con: Strap seems out of character. Sum: A refreshing twist on the modern minimalist theme. The Time Bum approves.